US President Donald Trump has said that his decision to end the longest government shutdown in the US is not a concession to the Democrats. On Saturday, President Trump tweeted that the case for national security has been greatly enhanced by what has been happening at the border and through dialogue, adding that the wall will be built anyway. On Friday, the US President signed a bill to end the shutdown for three weeks. 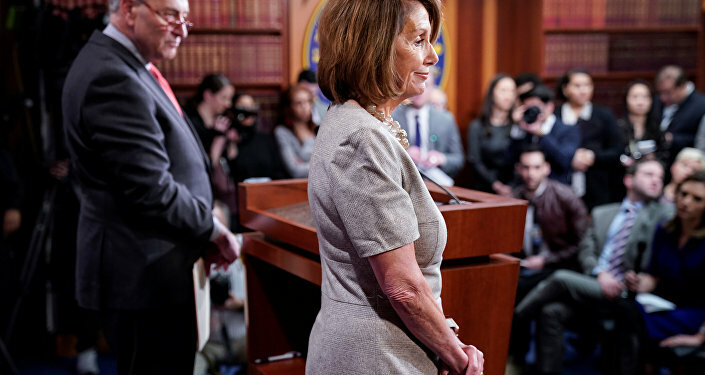 The legislature, however, continues to refuse to include the 5.7 billion in border wall funding the White House requested in the 2019 federal budget. Sputnik: President Trump has denied that his decision to end the government shutdown is a concession to the Democrats. I was reading an article by Bloomberg, who categorically stated that this is absolutely a loss for the President. What's your take on that? Daniel P. Franklin: He can say whatever he wants, but he was forced to concede because at some point a very important constituency was being inconvenienced by the shutdown, that being the flying public, and we've got the Super Bowl coming up this week, which is a big sporting event in Atlanta, and there's just no way we could tie up the airlines. The air traffic controllers were having a kind of a sickout, and there was just nothing he could do; he has to make the concession. And so, he can say what he wants, but he's lost this round. Sputnik: In your view, does this make it easier or more difficult for President Trump to push through his request for border wall funding? I mean 35 days, is it going to be easier to get this funding now? I mean it doesn't look as though that is the case and besides it was more a case of a power struggle between the Democrats and President Trump, wasn't it? Daniel P. Franklin: It's absolutely a power struggle. In our system we have separation of powers and independent branches of government, and the President is pretty much hammed in. The question for the Democrats now is whether they give him something or nothing; but he's not going to get the wall, it's just not going to happen. And the Democrats, their problem is that they've got to decide whether to give in or not because to give in even in the smallest amount, to give the President some sort of credit for doing something, would be to invite other shutdowns in the future. And so, the Democrats really have to make a decision about how much of a concession they're going to make to the President. But the wall isn't going to be built. Sputnik: Just give us your take on why Donald Trump has sort of taken this particular time to try to push this particular policy through. He's had two years where he's had power within the House and the Senate with the Republican Party; why has he chosen this particular time when the House is controlled by the Democrats? And it was always going to be a divisive and difficult policy to run through; is it because he wants to deflect the other issues that the Democrats want to throw at him? Daniel P. Franklin: That could be it. I mean, it's really hard to read the President's mind on this. This could be part of an overall strategy to deflect the Democrats from doing what they wanted to do when they got control of the House which would be to test a series of measures which didn't have a chance because they couldn't get to the Senate but nevertheless to establish the Democratic programme and to take the policy agenda and the public agenda away from the President. That might be what the President's thinking about. But I don't really think that the President thinks strategically that way. I think that he has squandered his chance to get what he wanted when he had control of both the Congress and the presidency, and now he squandered his chance and he is trying to slam the bill through and he's not going to get it. He is up against a really tough opponent: Speaker of the House Nancy Pelosi. Sputnik: She does seem to be appearing very strong and robust with regard to her position, and she's almost like Margaret Thatcher, the Iron Lady. I'm sure she's going to get a lot of applause for her strength, but at the end of the day it's basically leaving the great country, the USA, in a malaise in this current situation; we've never known such a divisive situation between the two parties, the Democrats and the Republicans. No one wins in this situation, and it's the public that's, obviously, going to suffer from this particular situation now for another two years of this administration. Is there anything that you can foresee that's going to harmonize or are we going to see a continuance of this indifference and malaise that's going on? Daniel P. Franklin: I think that the functions of government will get done and that always happens in these situations, where there's a kind of a stare-down in the background; the government is working. I think that it will get funding and will get programmes to continue to operate, employees will get paid. This shutdown was a test, it was a test of both the Democrats and the president's will, and the president blinked. And I think the Democrats have shown that they have the will and the public support to sustain this kind of stubbornness and the president can try again but he's going to lose again. The president is pretty much hammed; so I think we're kind of in a holding pattern till 2020, till the next elections. There're a way out of this, a couple of things that could happen. One thing is that if the president continues to be as unpopular as he is, and the real loss for the president in this particular case was that he lost some of his base. He's never tried to expand his public support but in making concessions to the Democrats he's lost some of his base, his support would go down even further. If it looks like they're going to get trounced in 2020, the Republicans may try to, as we say, primary — find a primary (election) opponent. I would expect somebody like Mitt Romney to be that person. That's one possible outcome. Another possible outcome is that congressional leaders can get together and work out what in a parliamentary system they would call a government of national unity, which is trying to figure out how to fund the government with majorities in Congress large enough to overcome the presidential veto, that's a possibility too.